Why is PR more digital? The industry is moving. Medias are changing. And PR agencies have adapted their methods and processes. We all saw it at CES in general and of course with our clients. We've seen a lot of articles about the death of the press release and we should always be wary of announced deaths. In any case, we deal with it . The challenge is not to publish content anymore but to create the narrative and engage the audience from the beginning. By positioning social media as an essential part of public relations, PR agencies are able to be more impactful. How to make headlines in 2016? Social media is more than just search engines. It is the largest source of traffic for breaking news. They represent 30% of all organic traffic to websites (including 24% for Facebook). The effectiveness of editorial is important: today any subject can make the headlines, but engagement comes from the coversation surrounding it. What is certain is that any PR strategy must take into account this change – and a large part of strategy is to be devoted to the creation of the online conversation. This is important because we have long believed that social media was a sounding board for medias. But data shows us the exact opposite: it is because we are engaged, we speak about it on social media, thus allowing the news to maintains its positions as a headlines. Otherwise, attention and online conversation create media coverage and not the reverse. For example, it is our reaction to events such as (e.g. political campaigns, Kayne West or SXSW ) that make the news constantly – news is not something that we are actively taking note of ("reading the paper") but something we chose to notice: and before you know it your Twitter feed is harboring some of the most creative and entertaining hashtags in the world. How much content is produced each day? There are over 211 million pieces of content produced per minute. How many blog posts have been published today? How many searches are done on Google each year ? How many tweets have been sent today? ➔ See the infographic: "Every minute of the day"
Now, you’re Monday ready. Enjoy your day! 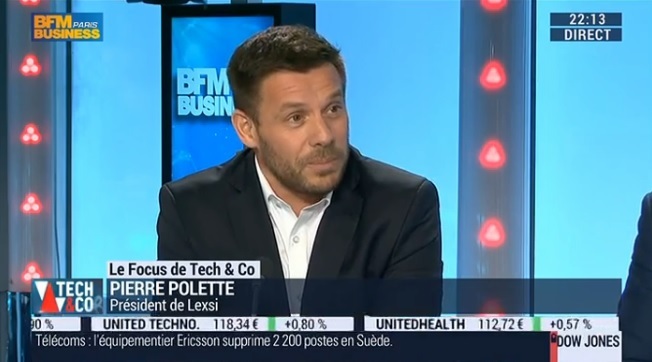 Pierre Polette, président de LEXSI, cabinet de conseil en cybersécurité, a pris la parole sur le plateau de Tech&Co, émission BFM Business animée par Sébastien Couasnon. A cette occasion, et aux côté d'autres experts, Pierre Polette a débattu au sujet de la nécessité de protéger les données personnelles et l'émergence des objets connectés menaçant leur confidentialité. Pour la 6ème année consécutive, nous avons mené une enquête qualité auprès de nos clients. 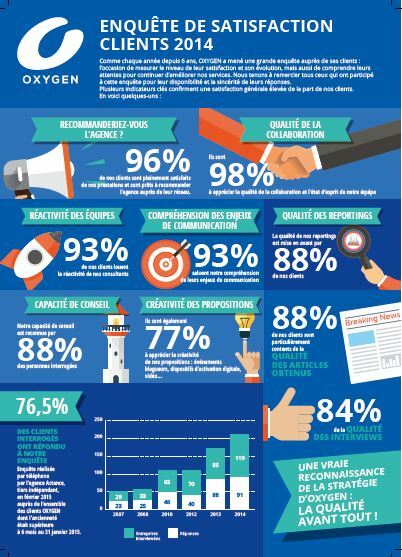 Menée par l'agence Actance, elle révèle, cette année encore, un fort niveau de satisfaction sur les principaux items du questionnaire. Nous remercions tous nos clients pour le temps qu'ils nous ont consacré à l'occasion de cette étude. Leurs réponses nous permettent de progresser et d'améliorer en permenance nos services. N'hésitez pas à nous contacter si vous souhaitez de plus amples informations sur cette enquête et les résultats. How to transform your crowdfunding campaign into a media success? Lately, you’ve probably heard a lot about Kickstarter, Indiegogo, KissKissBankBank… More and more start-ups and individuals are using those crowdfunding platforms to raise money, obviously, but also to make sure their product is ready for the market or have visibility in international media. Don’t think communication and public relations after your campaign has started. Because behind any successful campaigns lay months of preparation, including PR. Especially when you target the US market, where it is common to pre-brief US journalists under embargo. Sending them pitches a few weeks earlier gives them time to write their piece, allows you to communicate before and secure articles on the first day of the campaign. While it is absolutely necessary to let your local market know that you are launching a crowdfunding campaign, consider other populations that are based in North America, the Middle-East and even Asia that are ready to pledge and back your campaign. Europeans are still a bit cautious when it comes to crowdfunding. That is why it is important to spread the word to international journalists, mainly the Americans who are followed and read worldwide. Your social and personal networks will play a big role in your campaign’s success and will help increase your global visibility. Think of all the people you know who could relay the project to their own network. They could be your closed ones, of course, but also alumnus from college, networks related to your project industry, local networks, etc. Don’t hesitate to ask them to share the news to become viral and get attraction around your campaign! Sending a press release to 5,000 journalists is not enough to get coverage. It is necessary to select the right target, to send them the right and unique message they want and, more than anything, to follow up with them regularly (one of the reason why it is important to have a dedicated team). Depending on the campaign’s success, it could be relevant to let them know that the financial goal has been reached in less than 5 days, or that the project has reached 5x the established goal, etc. In general, there are 3 phases in a crowdfunding campaign: the first 5 to 10 days help generate a huge craze for the project, then the middle of the campaign is pretty slow, and finally the last 5 days when we observe a renewed interest. So, if you want to keep your public’s interest during the whole campaign, it is necessary to regulate your contacts with reporters and, if possible, to get articles in influent publications from the beginning to the end of your campaign to revive the activity. 5 – Call upon experts! A crowdfunding campaign is to be taken seriously. It requires time and know-how. You need to call upon media and networking experts, either in-house or by working with a PR agency. Your campaign will require resources on media relations for the duration of the project, and experts will give you the right advice on how to raise the media’s interest and reach your goals. Even if Public Relations are a huge part of a crowdfunding campaign, you should not neglect the other aspects: your presentation page should be well written and structured, bringing as much information as you can, with a precise roadmap for your product and company. Emphasize also on videos, pictures and team presentations to humanize the campaign. Plan regular newsletters to your backers to keep them updated on the project. Finally, last but not least, your product must be really unique and bring an added-value to your market. + Why is PR more digital? + Have a look at our latest customer satisfaction study! + How to transform your crowdfunding campaign into a media success?